The Navajo Generating Station is coal-fired power plant in Arizona, just outside the Grand Canyon National Park. It’s one of two coal plants that supplies more than 40% of Los Angeles’ power. Here in California, you hear a lot about our “green” reputation. We have one of the most ambitious greenhouse gas reduction goals in the country, and the state is certainly a hotbed for new solar and wind energy investments and installations. We also have a law that says electricity providers have to get 33% of their power from renewable sources by 2020. So… you might be surprised to hear that coal — that’s right, dirty ol’ coal — is still very much a part of the power supply in parts of Southern California. If you’re one of the 1.4 million residents of Los Angeles who gets power from the city’s Department of Water and Power, about 40% of your electricity comes from coal. But how’s that possible? Here in California, we don’t have much in the way of coal deposits, and no significant coal power plants. But we do have several public utilities that own portions of out-of-state coal power plants, and that entitles them to lots of less-than-clean, coal-fired energy. The Los Angeles Department of Water and Power owns 21.2%of the plant (510 MW). The contract expires in 2019, but LADWP General Manager Ron Nichols told KQED QUEST reporter Lauren Sommer that the utility is looking into ending the contract as early as 2014. 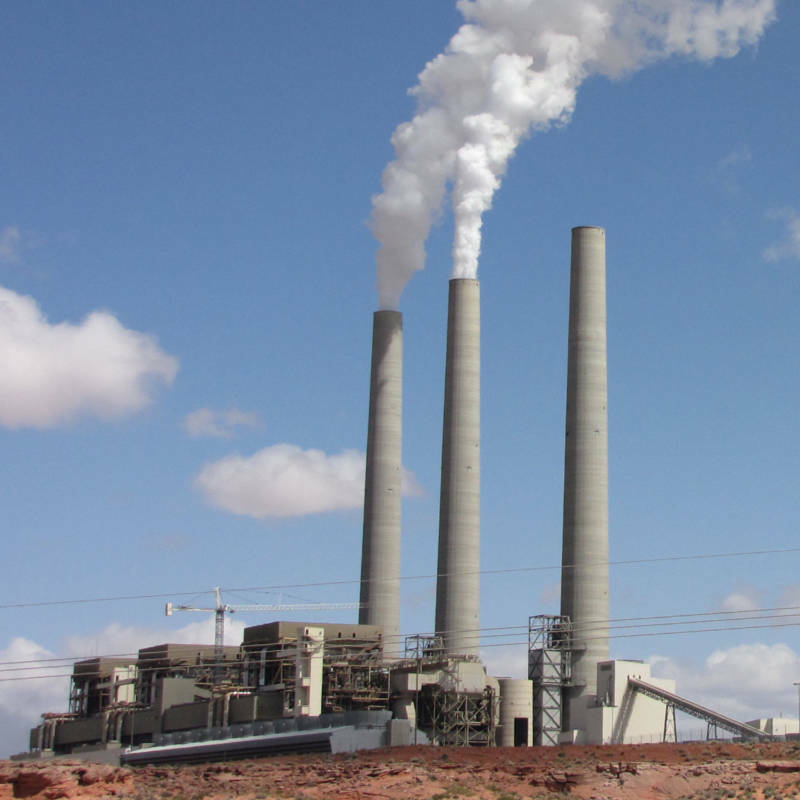 According to the Sierra Club, the plant was, as of 2004, the fifth-largest emitter of CO2 in the nation (among power plants), and uses eight billion gallons of water from Lake Powell each year for cooling. California’s Department of Water Resources owns more than 67% of this plant (183 MW). According to the DWR, Reid Gardner supplies more than 18% of the agency’s power. Its contract expires in 2013, and DWR has said it will not renew the agreement. Several California companies, primarily LA’s DWP, own rights to 96% (1,574 MW) of energy generation. Southern California Edison, which supplies power to approximately 14 million Californians, owns 48% of this plant (786 MW). The utility has applied to sell its share by 2012. Two of the plants four units are owned in large part by California cities, towns, and agencies. Here’s a map from the Sierra Club showing where the coal plants that supply California are located. Listen to Lauren Sommer’s radio report about California’s struggle to quit coal. Now consider reporting on how the grid lines currently bringing dirty coal power from the five plants can be used to bring wind, solar, and geothermal power to California, especially as the coal plants progressively get closed down. I agree, excellent. Is the Reid plant related to the esteemed Senator? * The plant fully complies with the federal Clean Air Act and we are proud of its environmental performance. In fact, plant owners just recently spent $320 million to install state-of-the-art emissions controls. As a result of those upgrades, emissions of nitrogen dioxide fell by 44 percent, sulfur dioxide by 71 percent, particulate matter by 72 percent and mercury by 87 percent. * The EPA has approved its own plan to require the plant to install additional controls to improve visibility in area parks and wilderness areas. We are appealing this ruling because of the enormous expense of the EPA-required technology. The State of New Mexico has approved its own plan for San Juan that would further improve air quality and meet federal requirements but do so at one-tenth of the cost ($77 million versus about $750 million or more for the EPA-required technology). We support the state plan and are willing to make this new investment. Ultimately, the costs of complying with either plan will be borne by the 2 million electric users in New Mexico, Arizona, Utah and California the plant serves and who depend on the plant for reliable, affordable power. We are committed to continuing to improve the plant’s performance and would appreciate the opportunity to comment in advance of publication on any future stories regarding San Juan Generating Station. More info on the plant is available at http://www.pnm.com/sanjuan. Thank you.